Dangerously quick and easy “sugar” cookies. The sugar is really maple syrup or agave and the recipe is designed for small batches so you don’t have to be tempted by a whole dozen cookies when you really just want one or two. To offset recipe testing for the book, holiday parties, and of course Christmas baking, I’ve been exercising outdoors for 30 minutes a day. A couple of nights ago Jared and I took Jackson for an early evening walk and stopped to look at the neighborhood Christmas lights along the way. One particular house is lit up like the Griswald’s and has a constant stream of onlookers. We stopped and took Jackson out of the stroller to take pictures and show him the dancing and singing Santa Clause. As I turned to cross the street back to the stroller, I stepped into a pothole and fell hard all the way to the ground. The other onlookers hollered out their car windows a concerned, “Are you okay?” Thankfully, Jared had Jackson and my ego stung more than my hands and scratched up hip did. With a can-do attitude, and a “Let’s get the St. Nick out of here” plea, I held my head high and jogged the whole way home. 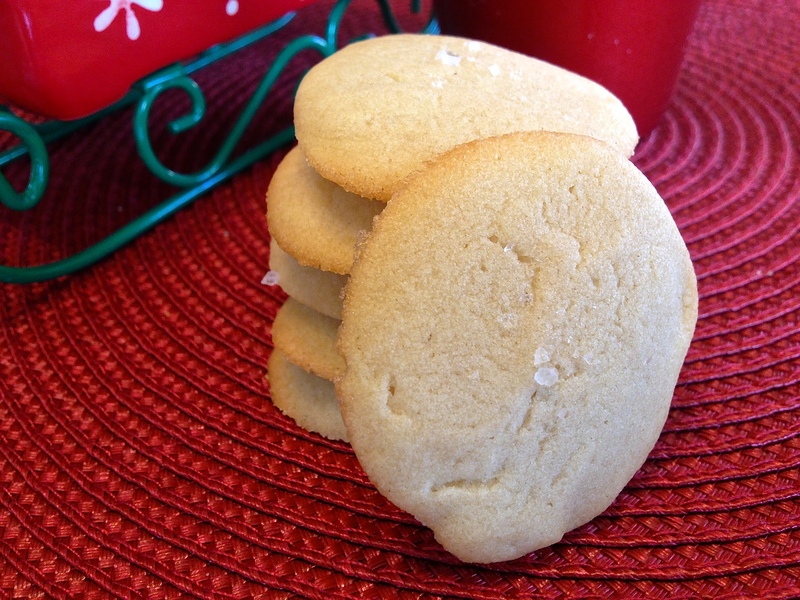 In the spirit of stumbling, I also stumbled across something amazing this week, a delicious easy sugar cookie using just five basic ingredients: butter or margarine, maple syrup or agave, flour, vanilla extract, and sea salt. On a whim, I just threw these ingredients in a bowl and into the oven, thinking surely an egg-replacer or at least some baking soda or powder would be needed. But they turned out so delicious! Because I can’t be trusted with more than a few cookies at one time (seriously, it’s a problem), I made a recipe that could easily be modified to make as few as two cookies at a time. Instead of actual sugar, I used maple syrup in one batch and agave in another. The agave’s flavor is more subtle, but the maple syrup gives a nice depth of flavor. Both are winners. I have three holiday parties and a MOPS meeting to bring food for this week. It’s that time of year! These are so easy that I’m sure I’ll bring them to at least one of the events. 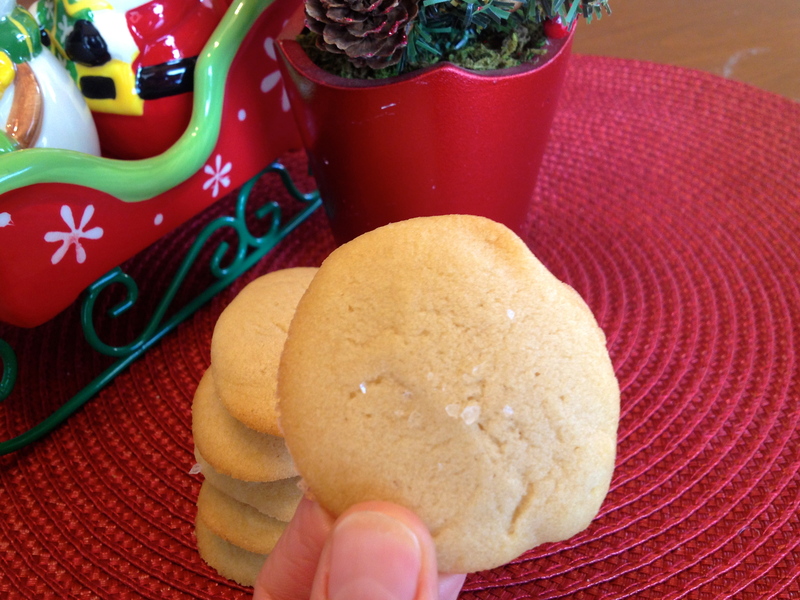 Everyone needs a good go-to sugar cookie recipe for the holidays right? 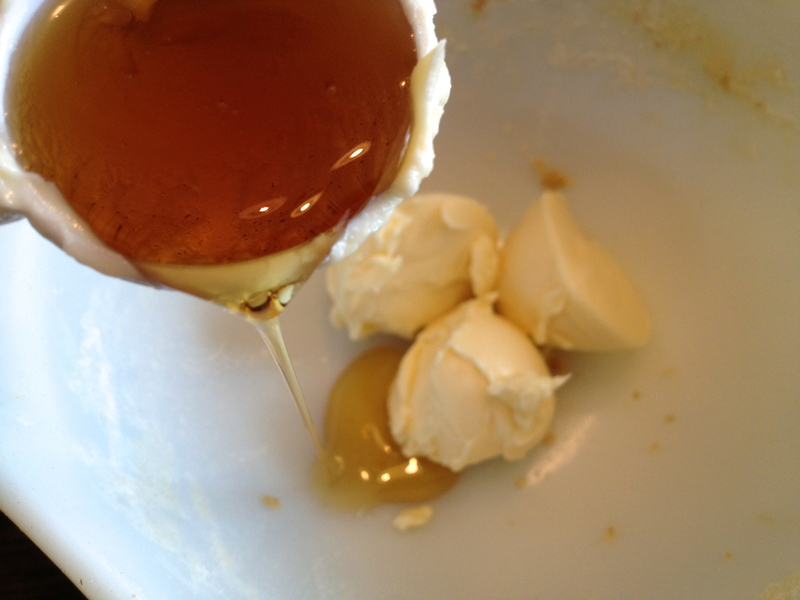 With a whisk or spoon, mix the butter and maple syrup or agave. Stir in the vanilla. Stir in the flour one tablespoon at a time. Mix the flour into the wet ingredients. Line a pan with parchment paper or a silicon baking mat and scoop out tablespoon size drops two inches apart. If you don’t have parchment paper or a silicon baking mat, an ungreased cookie sheet works fine. 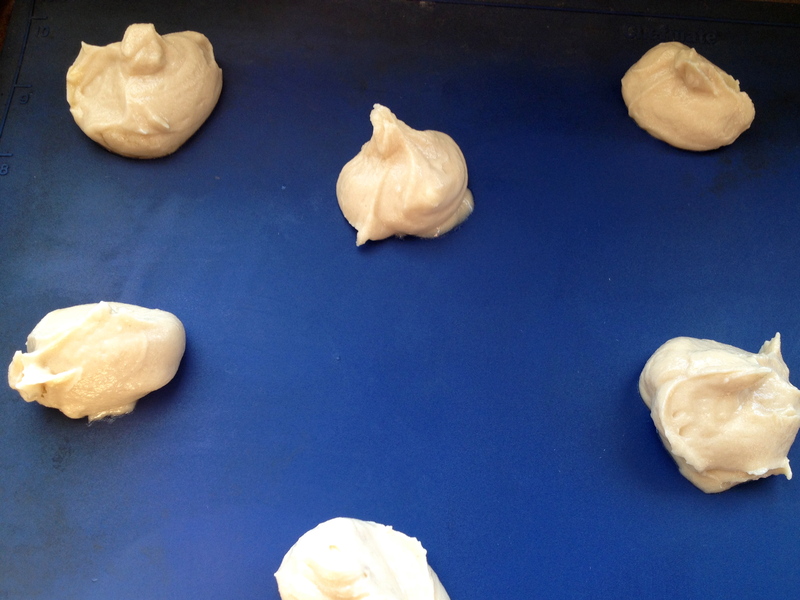 The cookies will be a little darker on the bottom and may spread a little more. But they are just as tasty. In fact, if you like your cookies with a little crunch, you may like them better straight on a pan. Sprinkle with just a touch of sea salt and bake for eight minutes or until slightly brown around the edges. *Add a pinch of cinnamon and dust the tops with cinnamon sugar before baking for snickerdoodles. *Sub almond extract (just a touch goes a long way and sprinkle the top with slivered almonds. *Make a powdered sugar icing and add sprinkles on top. 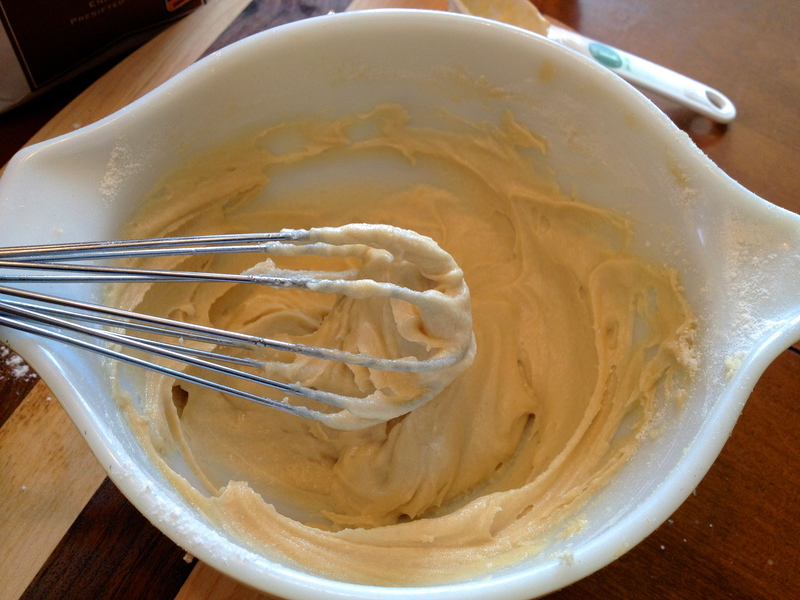 Do you think this batter could be chilled to use with cookie cutters? I’m planning on making holiday cookies with my toddler and am looking for a less “sugary” sugar cookie. Thank you! So sorry we missed this question. I am sure it would be wonderful chilled and rolled. Did you try it out? How did it work for you?